This is the moment a clever squirrel balances a hoard of nuts on a giant fungus growing out of a tree and uses it – as a PLATTER. The red squirrel scampered down the birch tree and perched on top of the Razor Strop Fungus which also served as a handy watch tower. He waited for seven hours in a hide he built 20 metres away from the tree to get the remarkable set of shots. 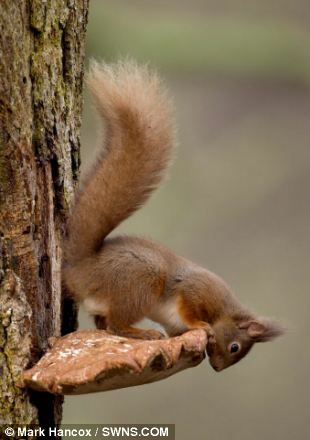 Mark, from Hartlebury, Worcs., said: ‘I love going to the Cairngorms because you never know what wildlife you might see. ‘I was actually looking for a rare bird when I came across this large fungus sticking out of a tree about four feet off the ground. ‘It must have been about half-a-foot in diameter and about an inch thick. ‘I took some close-up snaps of it just for my own records because I thought its shape and size were interesting when I spotted some chewed nuts on it. 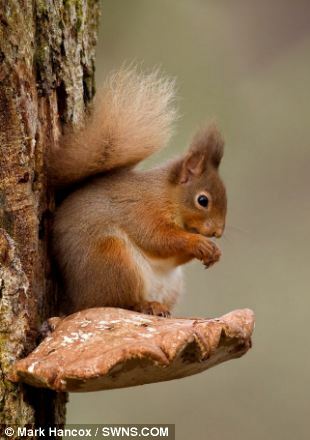 ‘I put two and two together and realised it must be some kind of natural shelf which is being used by a squirrel. ‘I set up a hide far enough away from the tree to stay unheard and waited. 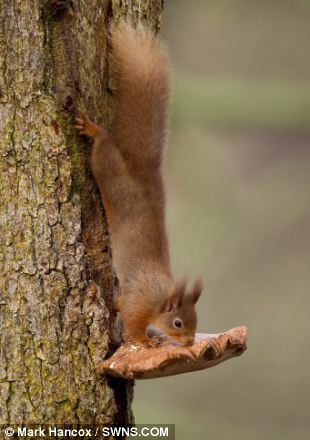 ‘After seven hours I spotted this little red squirrel poke his head out from the top of the tree and scamper down to the fungus.